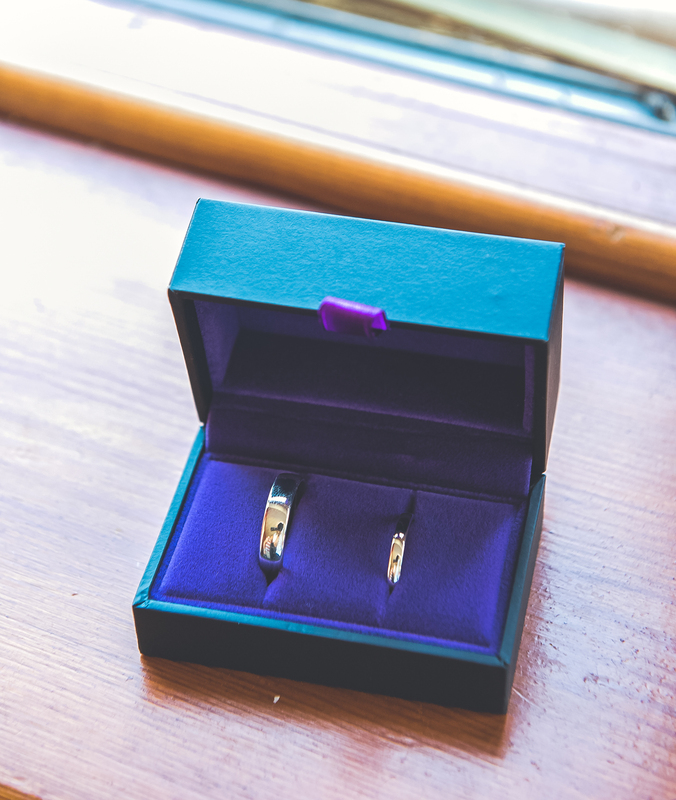 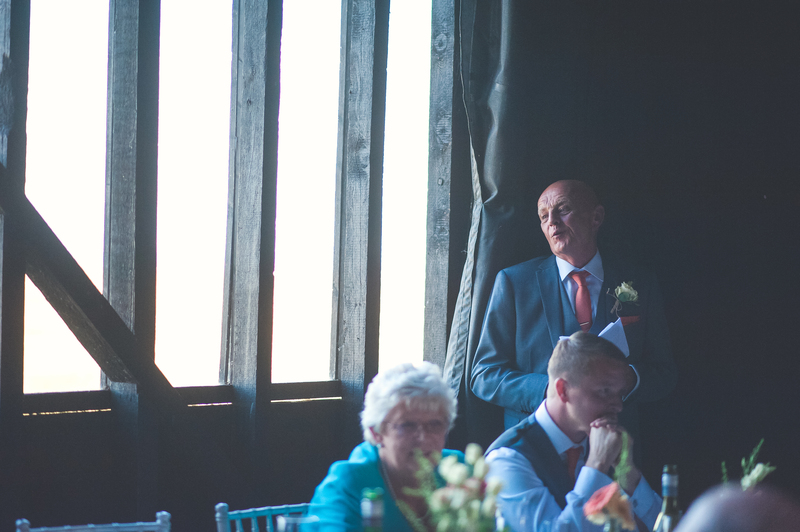 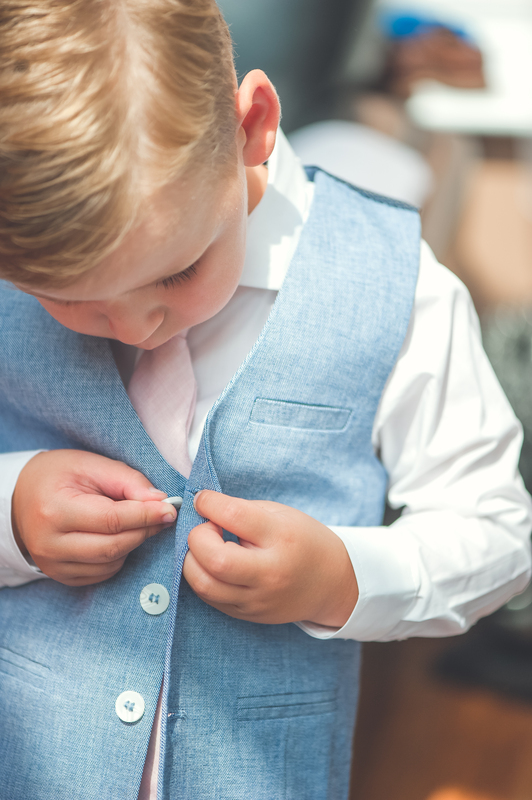 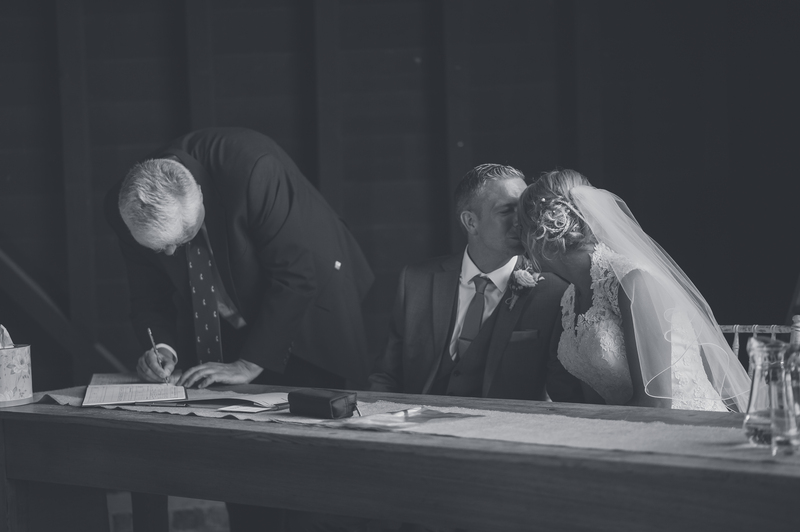 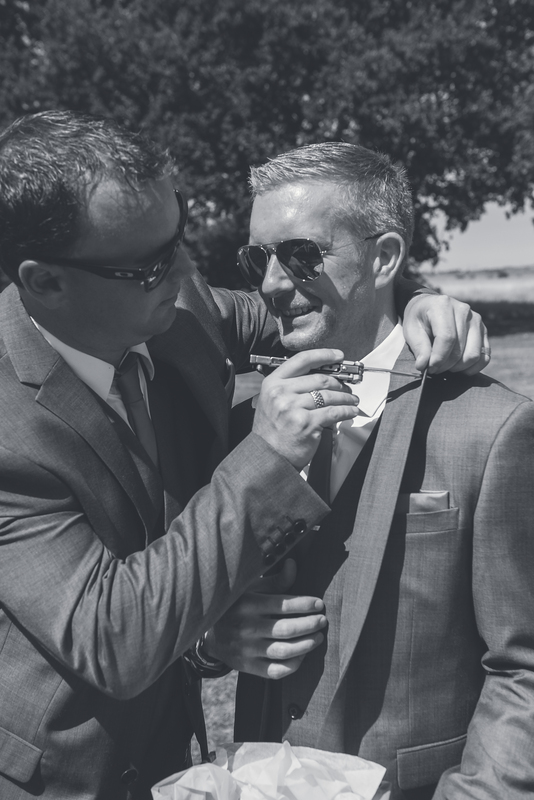 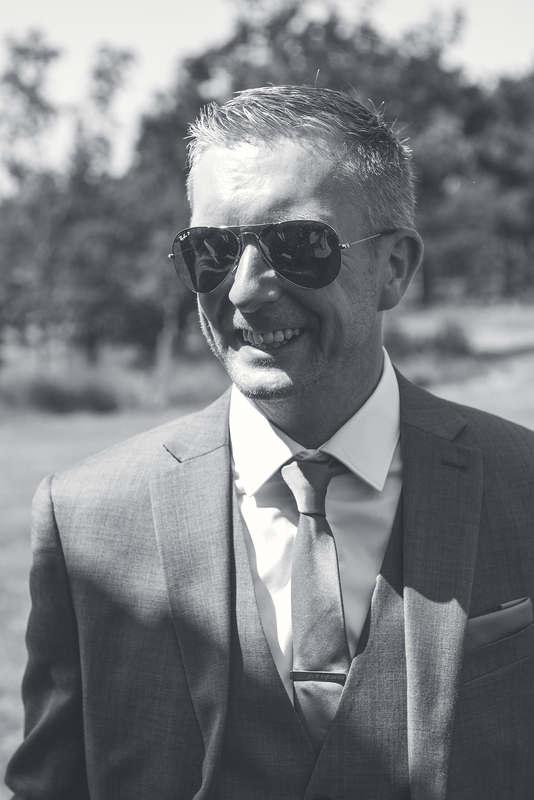 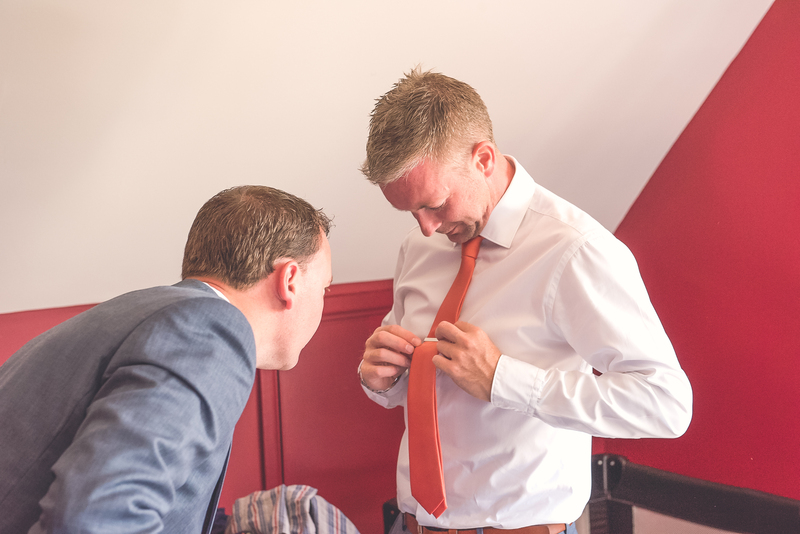 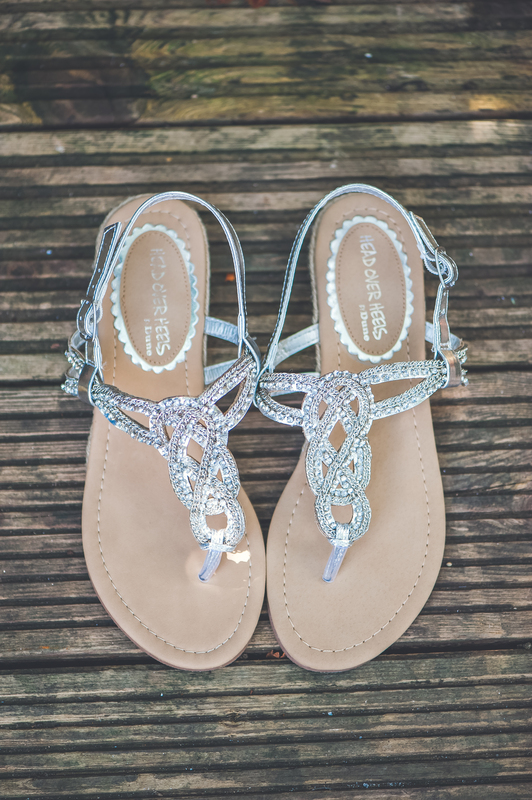 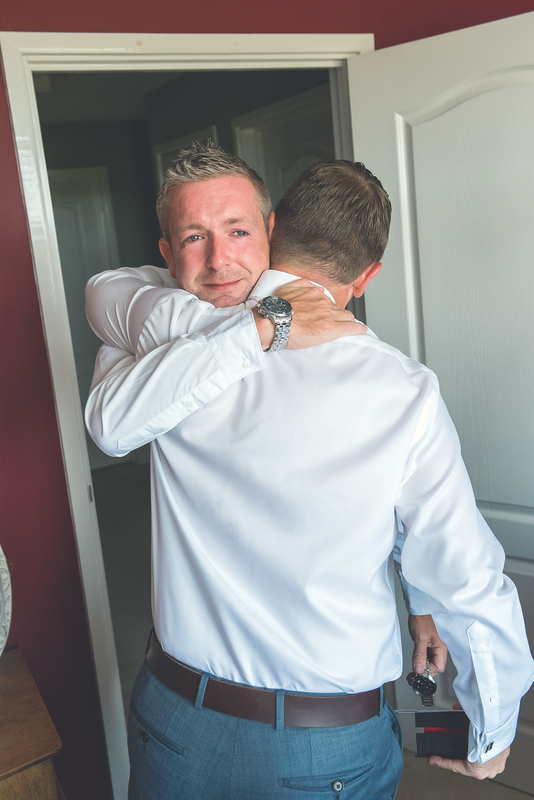 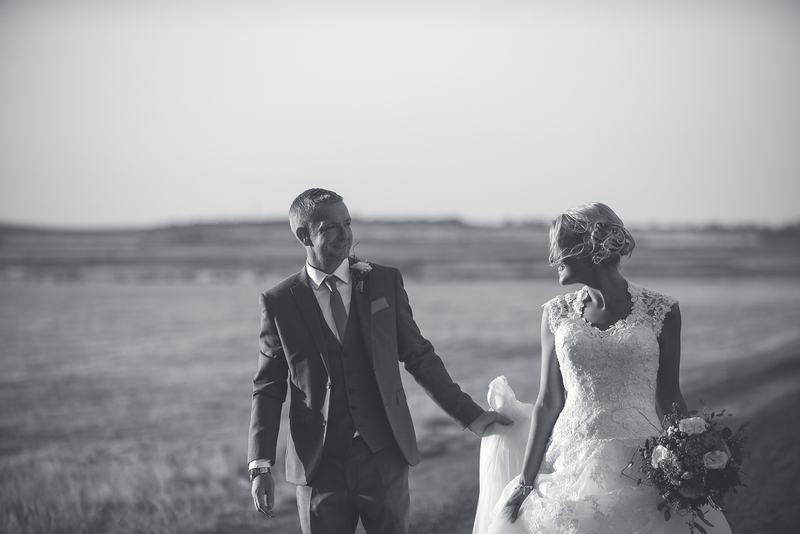 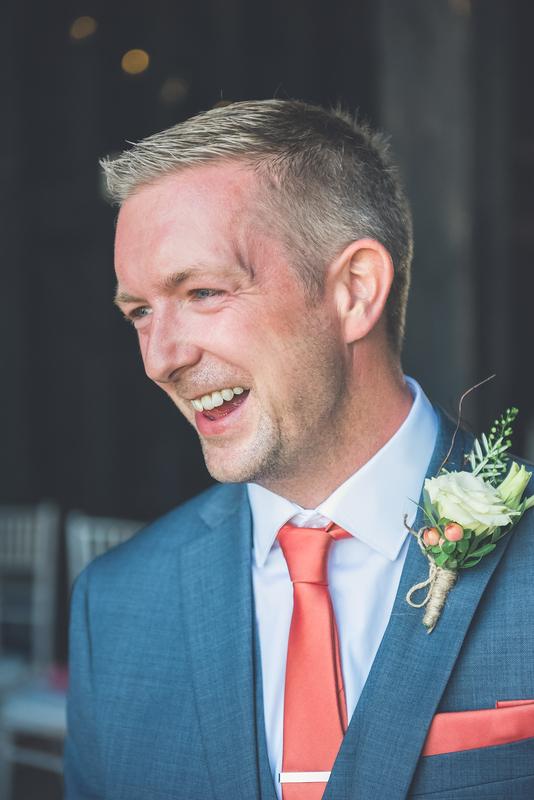 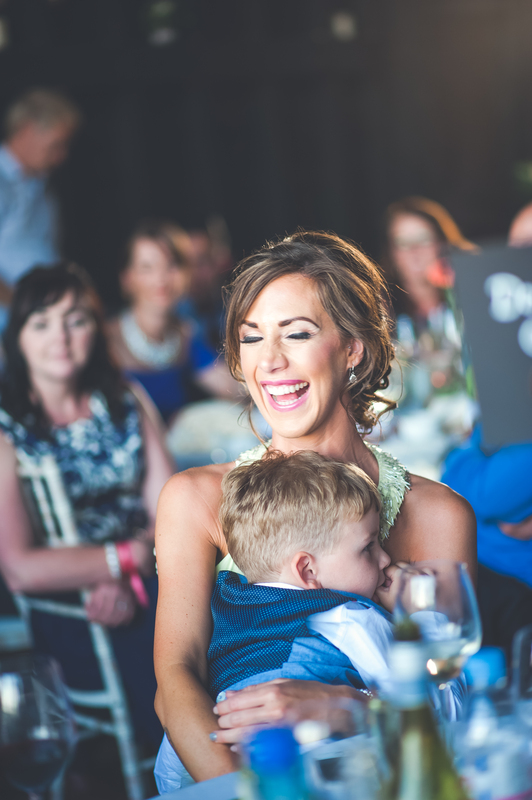 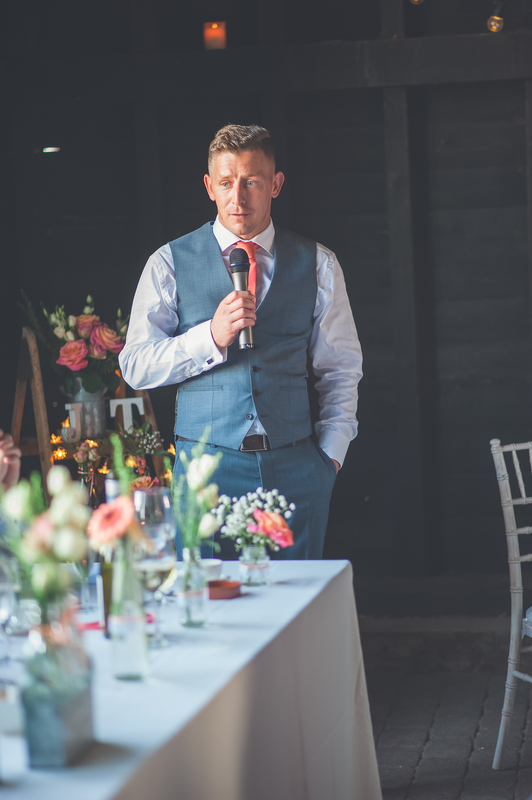 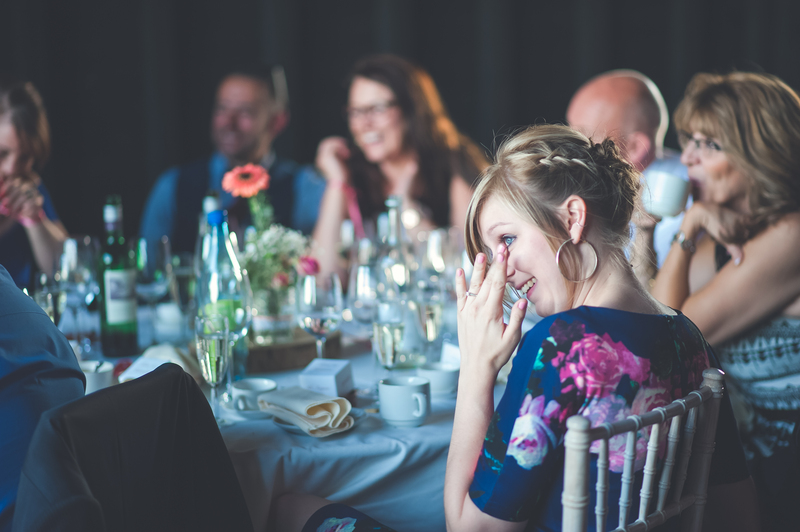 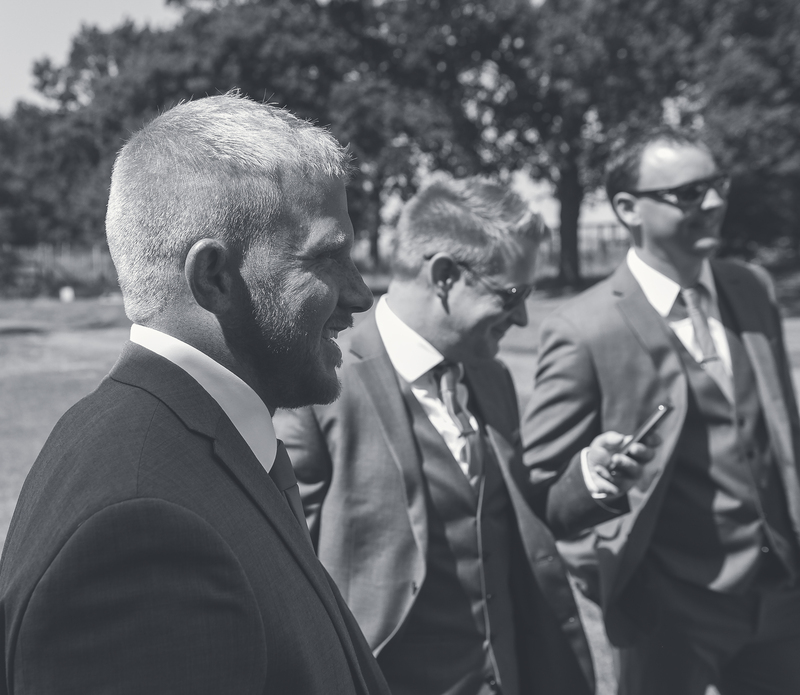 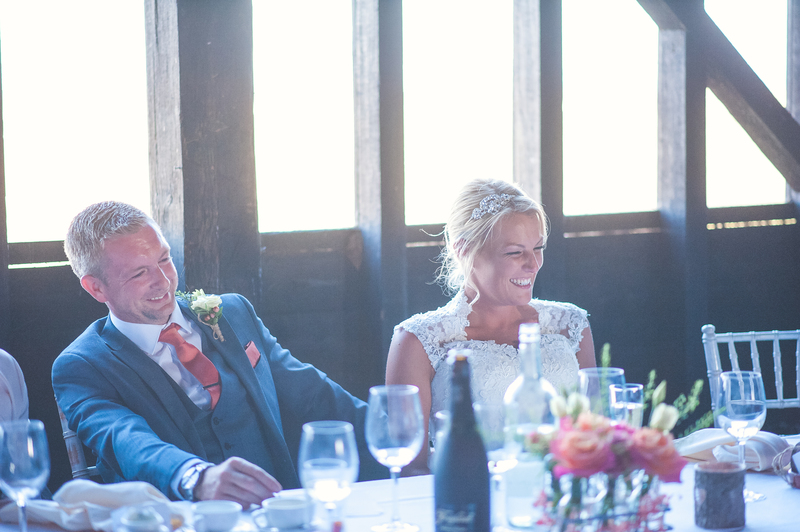 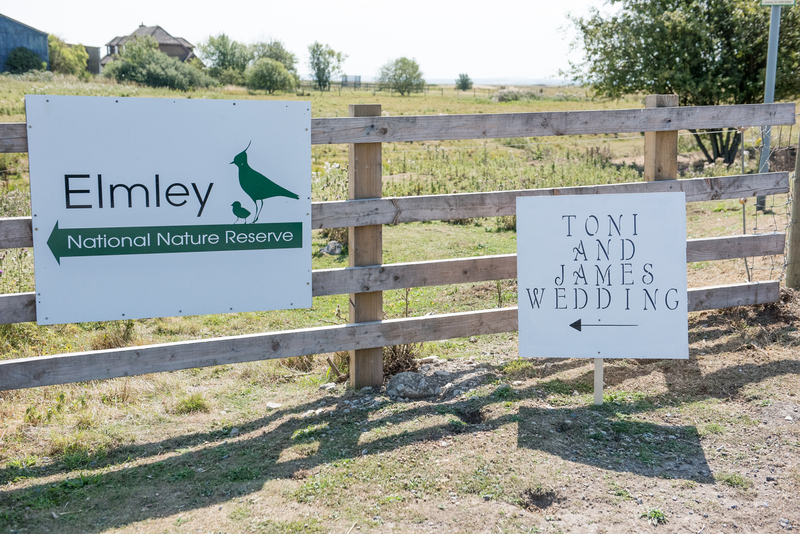 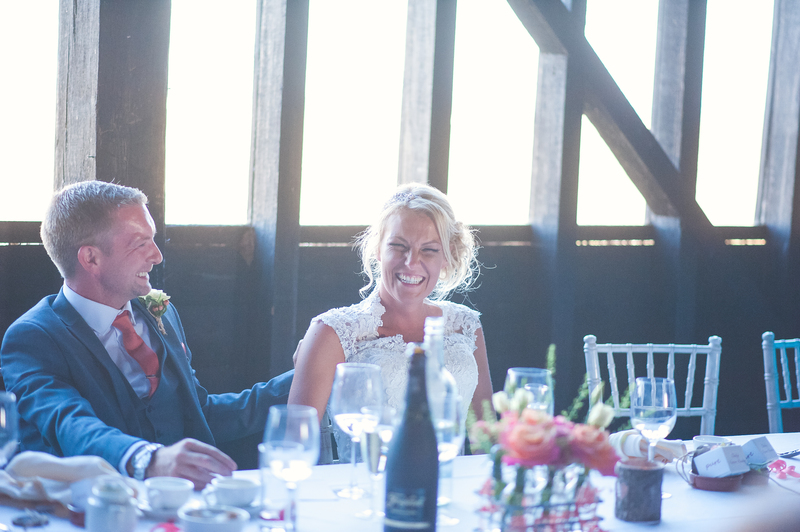 James and Toni’s wedding at Elmley Nature Reserve really stands out for us as one of our definite faves. 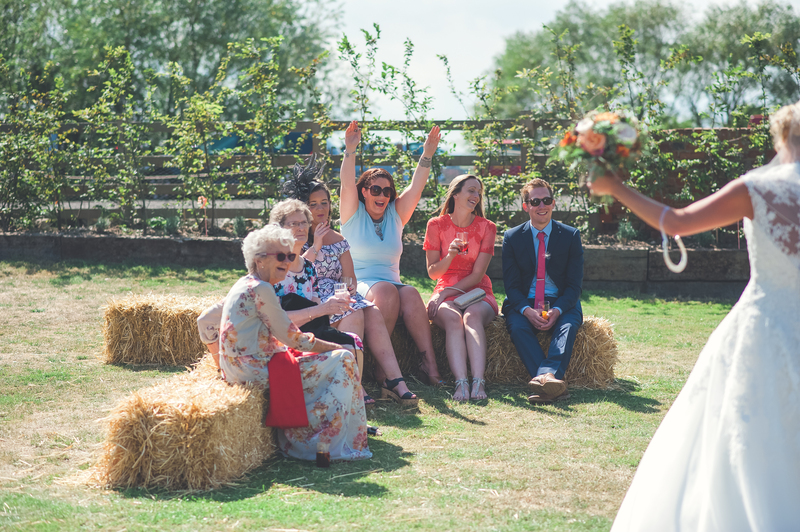 Before the wedding we’d spent some time with James and Toni for their engagement shoot amongst the orchards in the countryside near Canterbury, on the most glorious early summer evening. 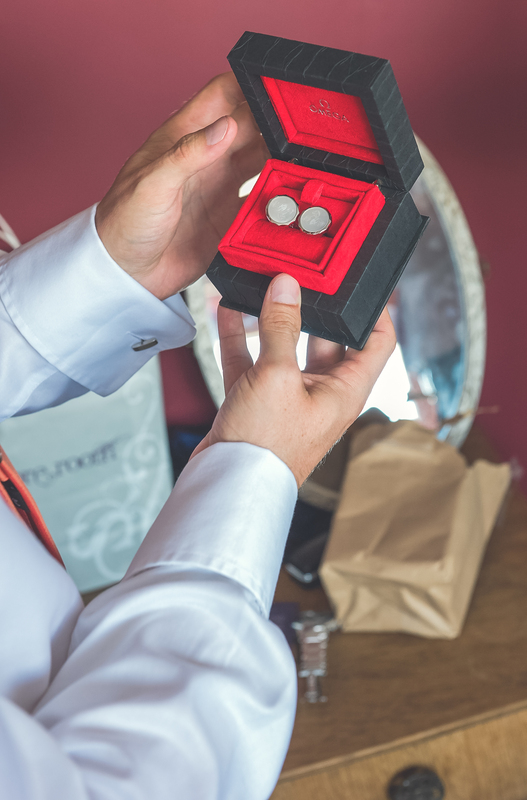 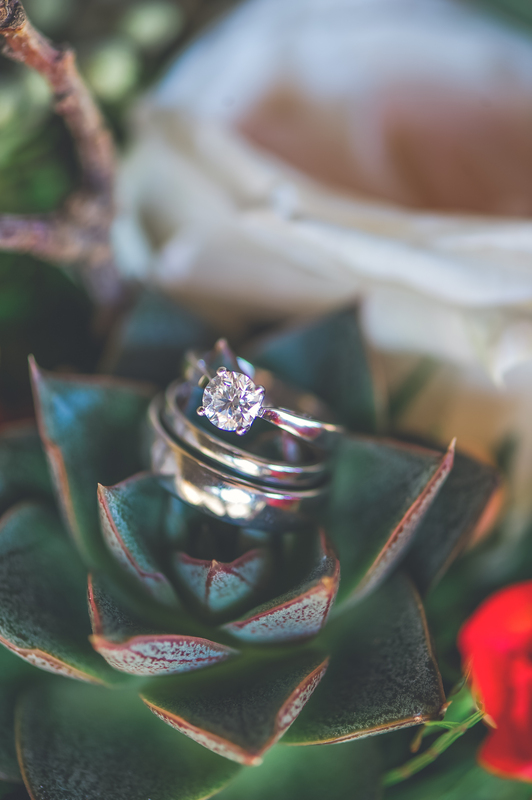 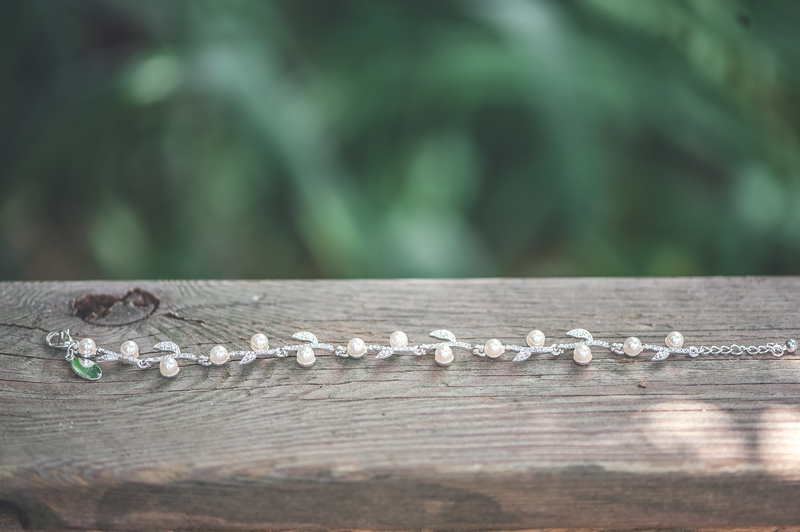 An engagement shoot is a wonderful way to get to know each other a bit before the big day, and for couples to get used to being in front of the camera. 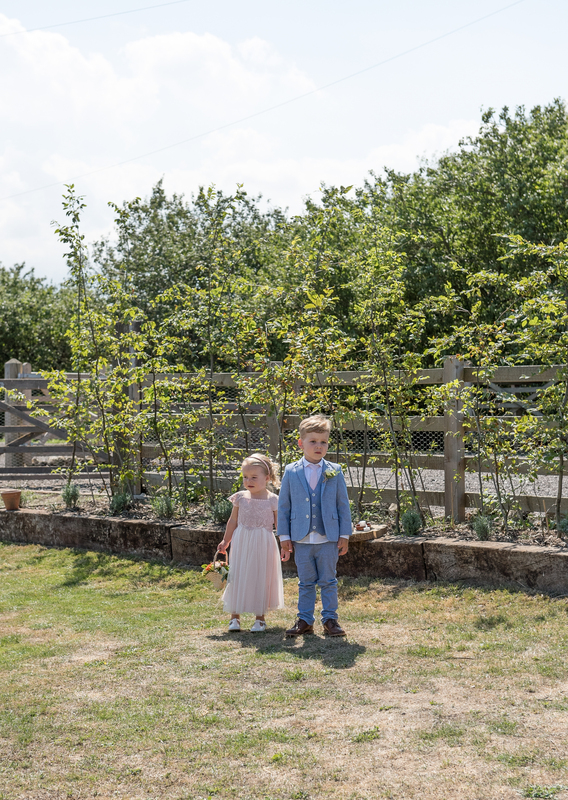 As it happens, James and Toni were super relaxed and very natural in front of the camera, which made for some wonderful photos! 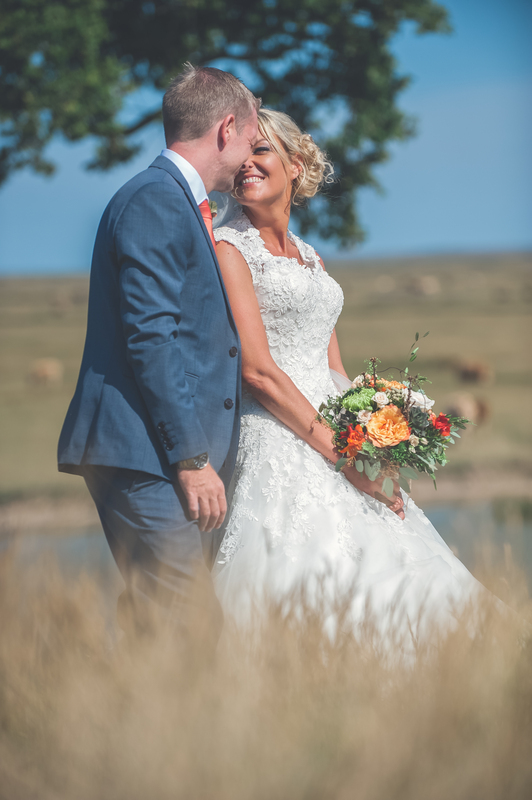 We were excited about shooting at the nature reserve, partly because it was our first time there, but also because of its remote location; it has a wilderness style feel with it’s big skies, cattle, marshland and plenty of birdlife. 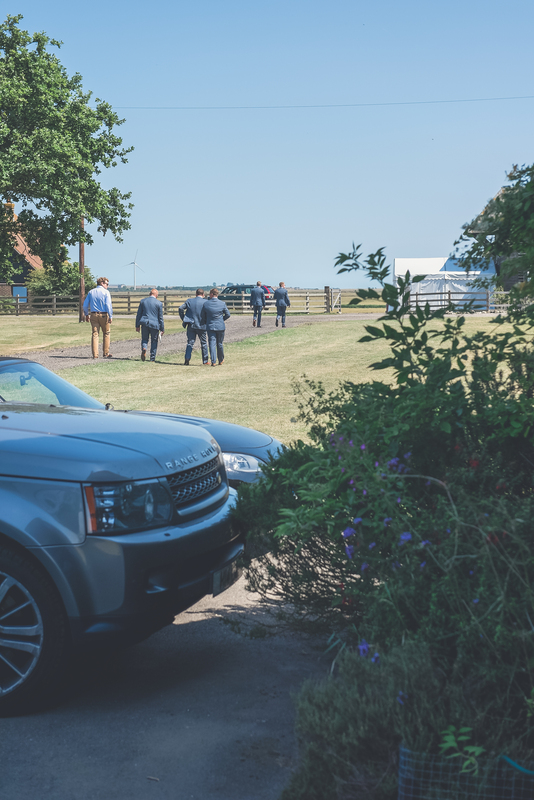 The drive to the barn is down a two mile single track with wildlife all around. 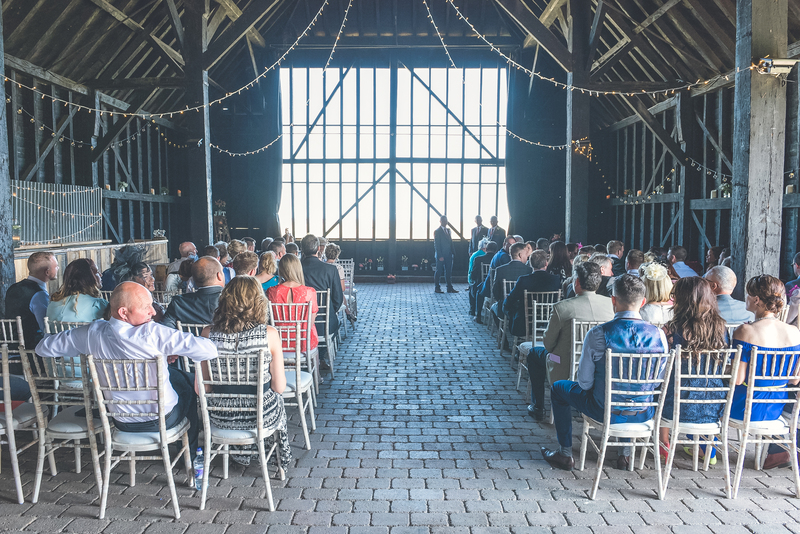 The authentic Kentish barn is absolutely perfect for couples to create their own completely individual style, surrounded by a perfect backdrop of nature. 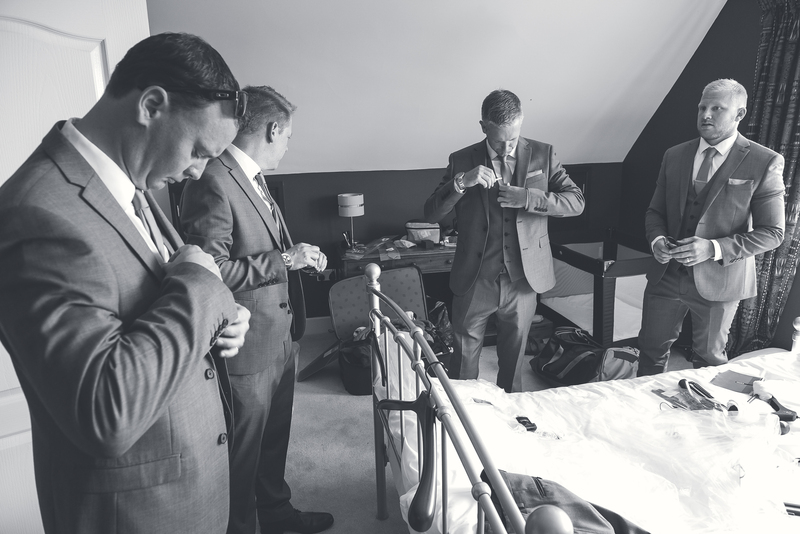 On their wedding day I spent some time with Toni at her mum’s with her bridal party, and photographed the preparations as they got underway. 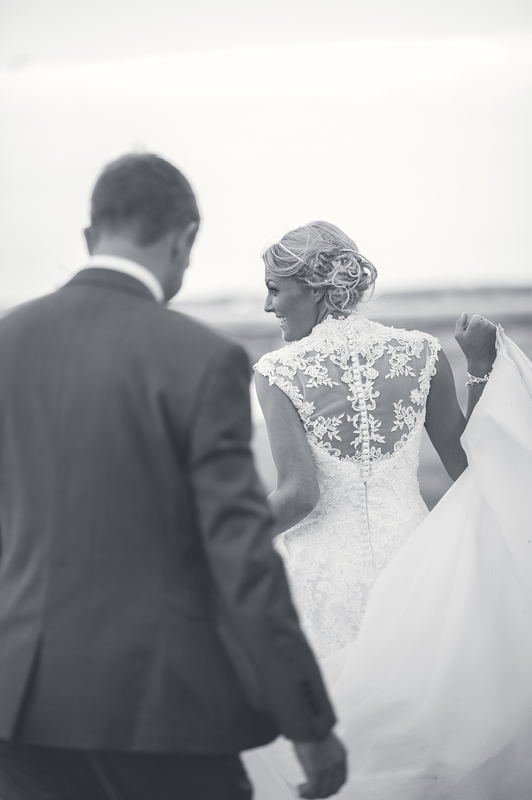 Toni looked absolutely stunning in her Justin Alexander dress as she headed off to the venue to get married to James. 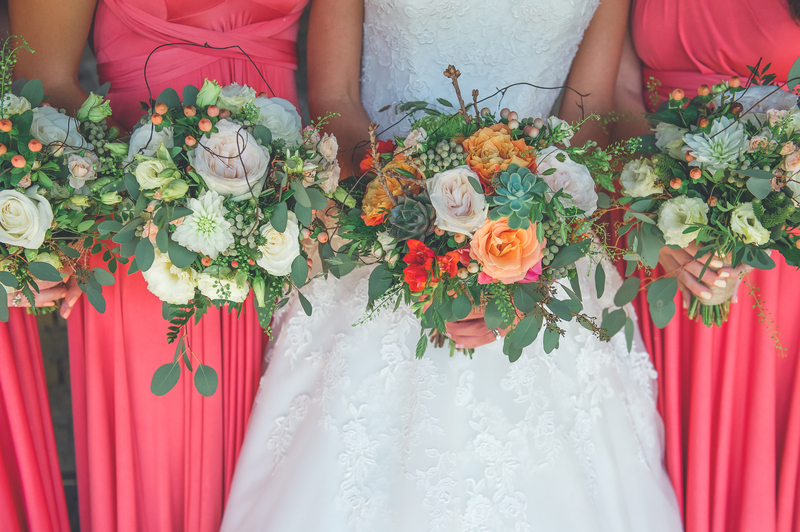 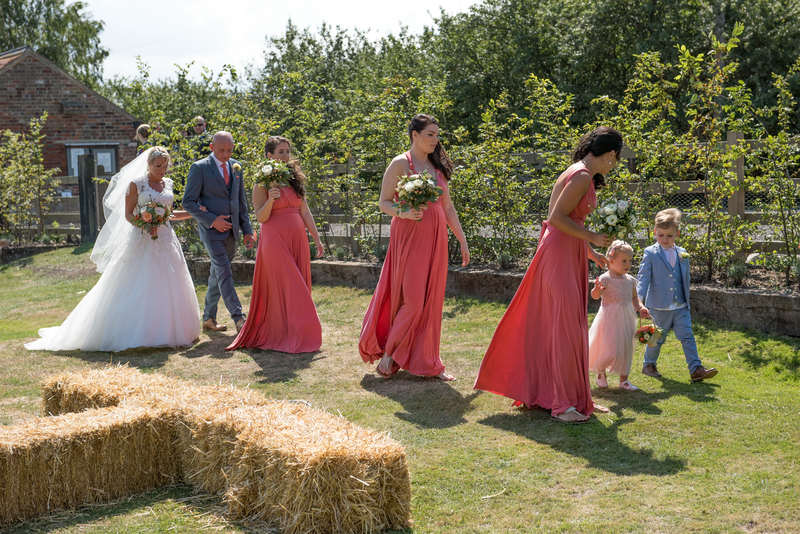 Her bridesmaids looked beautiful in coral coloured dresses, complimented by the most beautiful vibrant flowers. 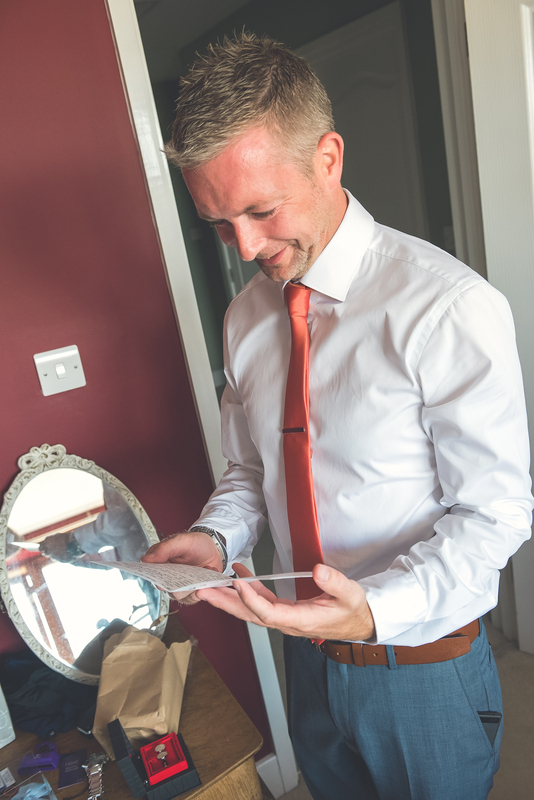 Kevin meanwhile was already at the reserve, and was able to spend some time with James and his groomsmen for their preparations, including a very emotional moment for James when he received a gift and a card from Toni. 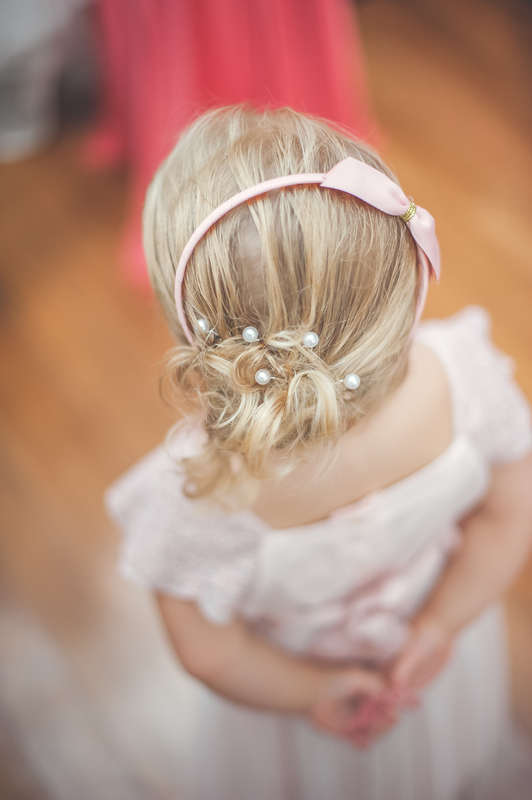 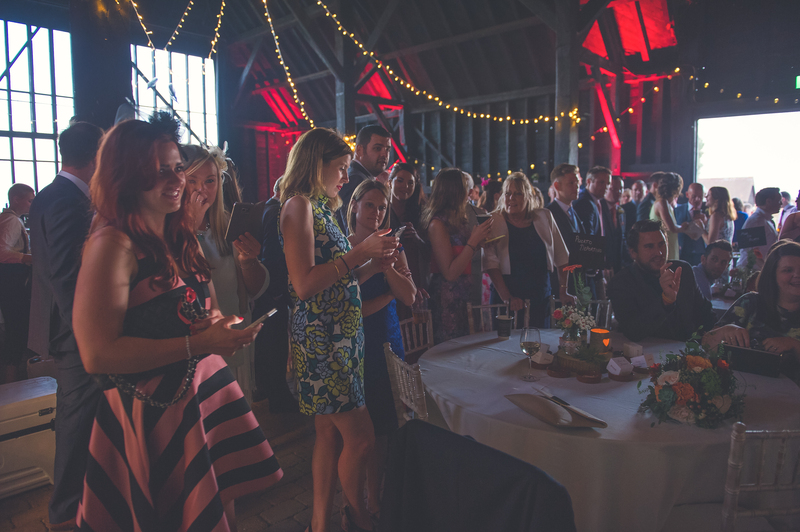 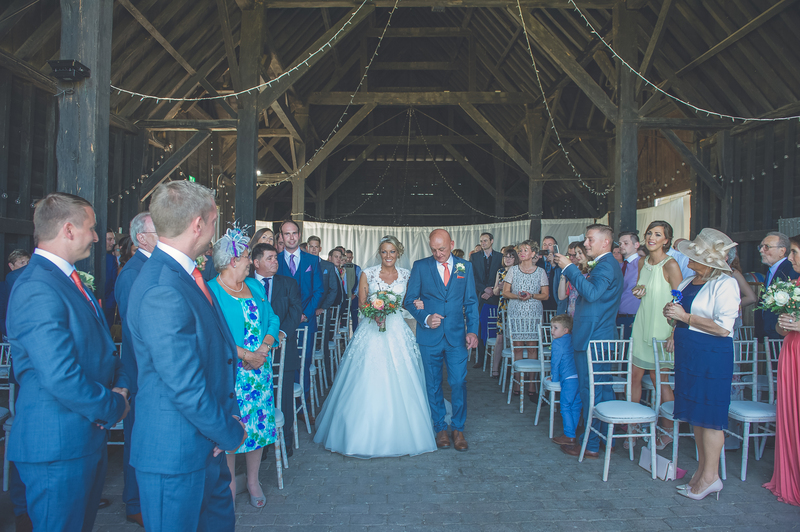 The ceremony was beautiful, with the barn packed with James and Toni’s family and friends. 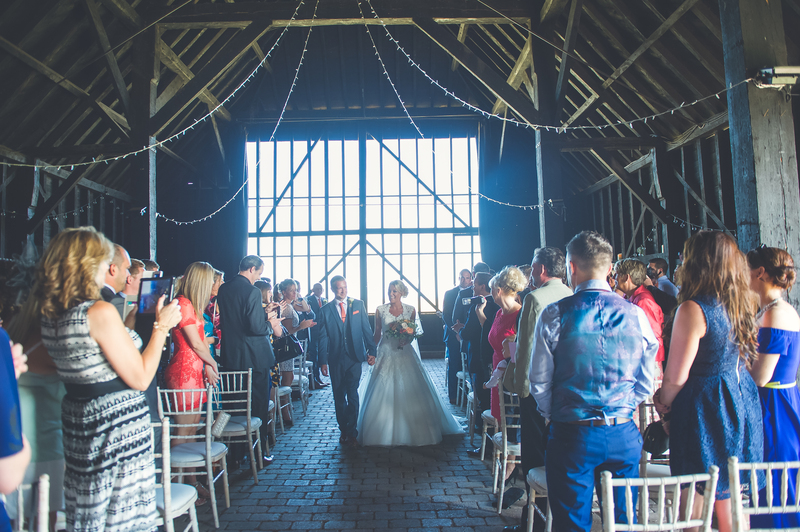 Light flooded in from the floor to ceiling windows overlooking miles of unspoilt terrain. 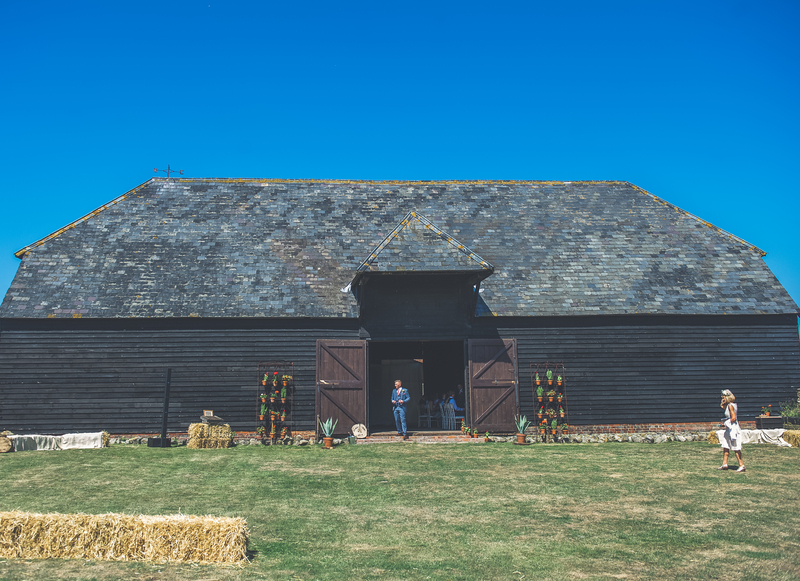 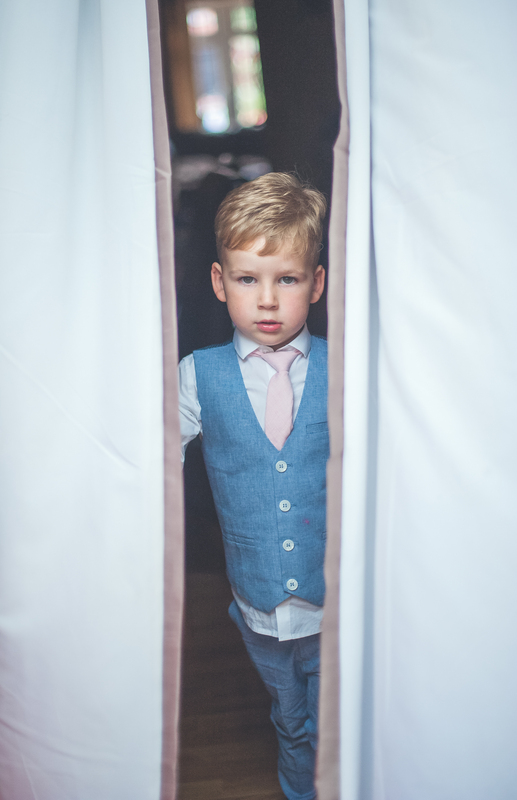 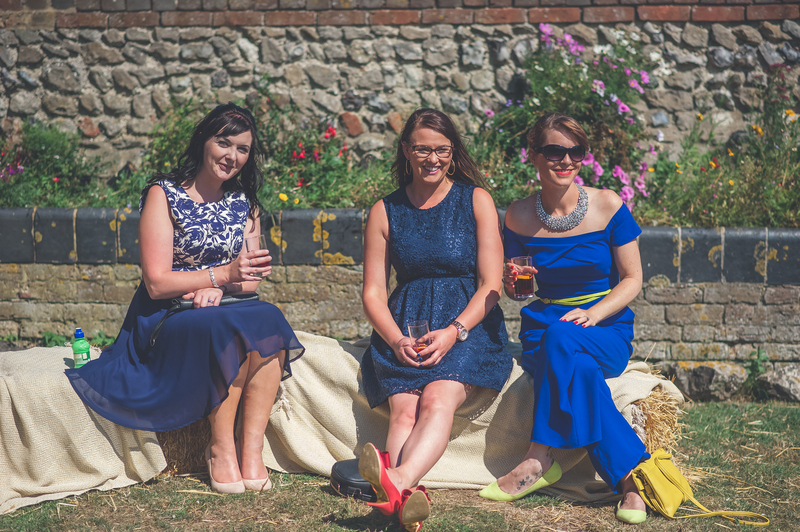 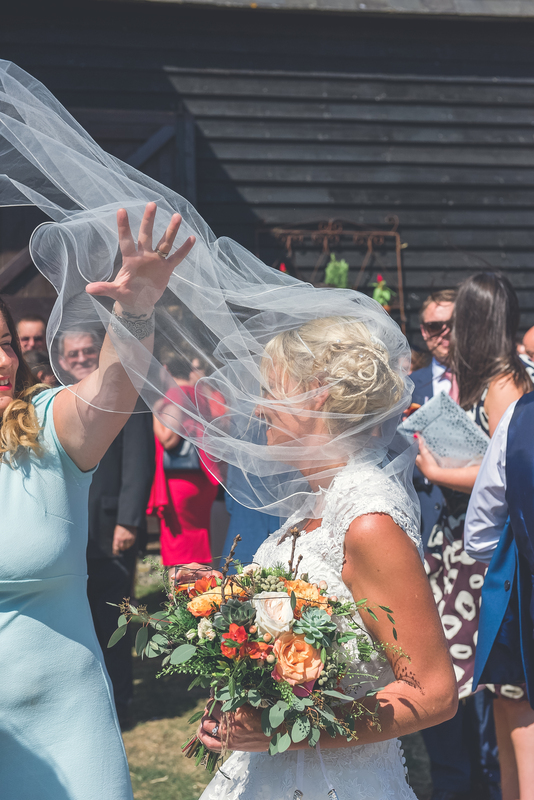 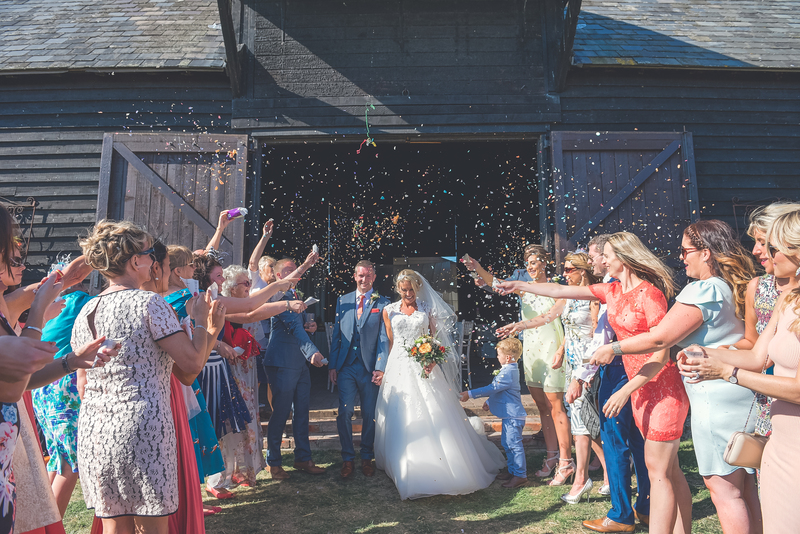 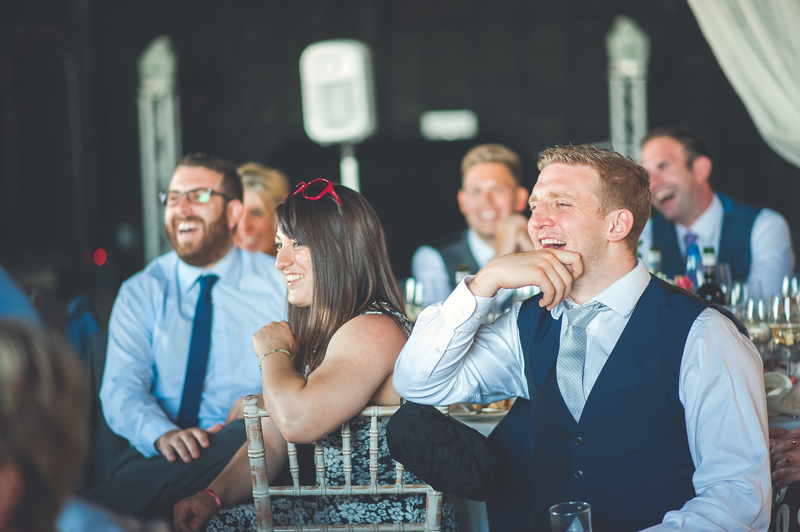 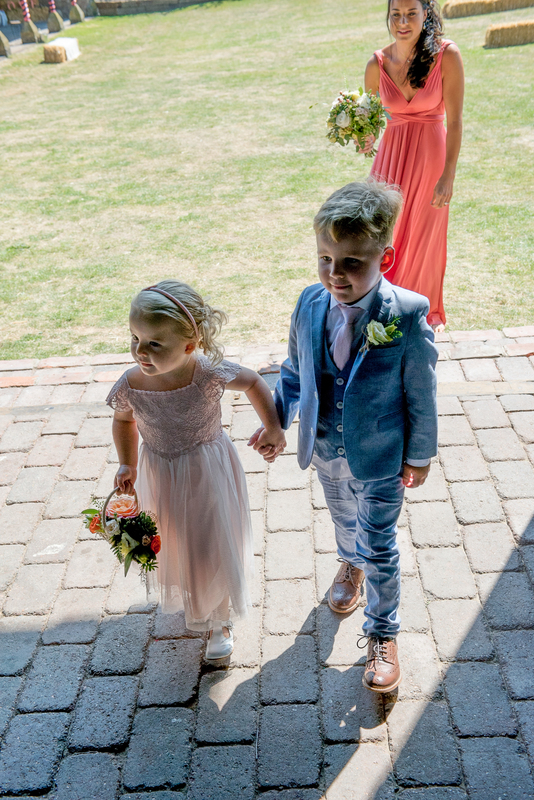 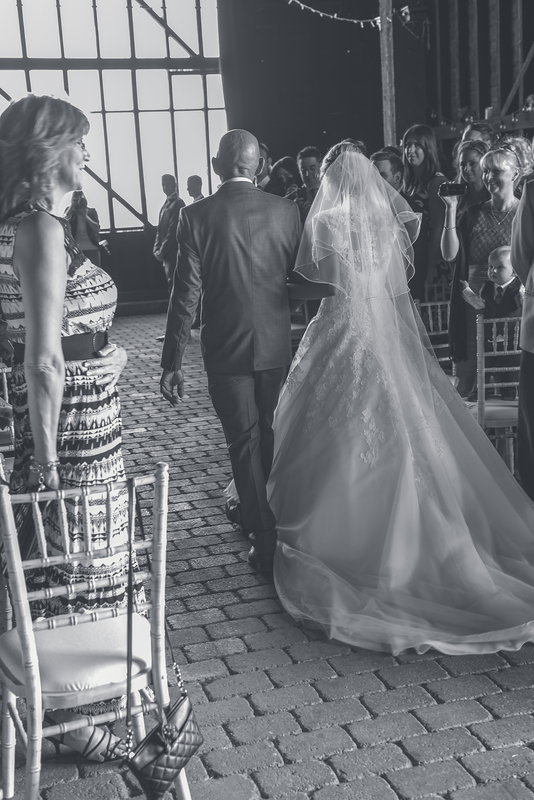 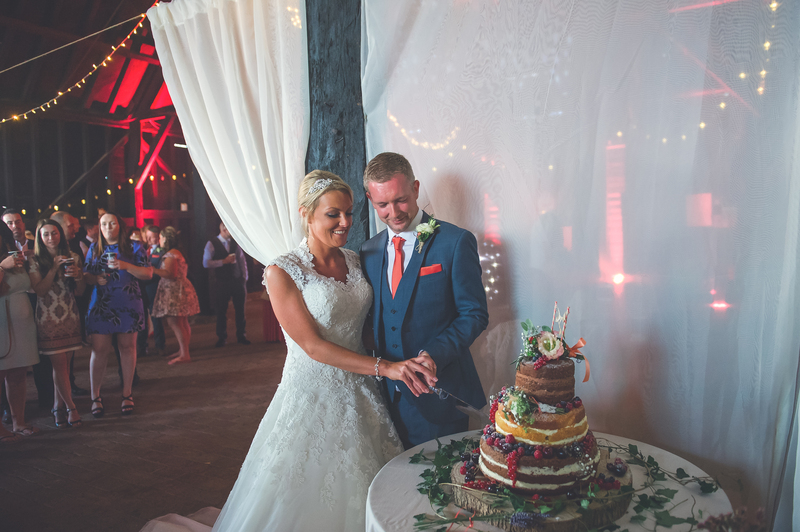 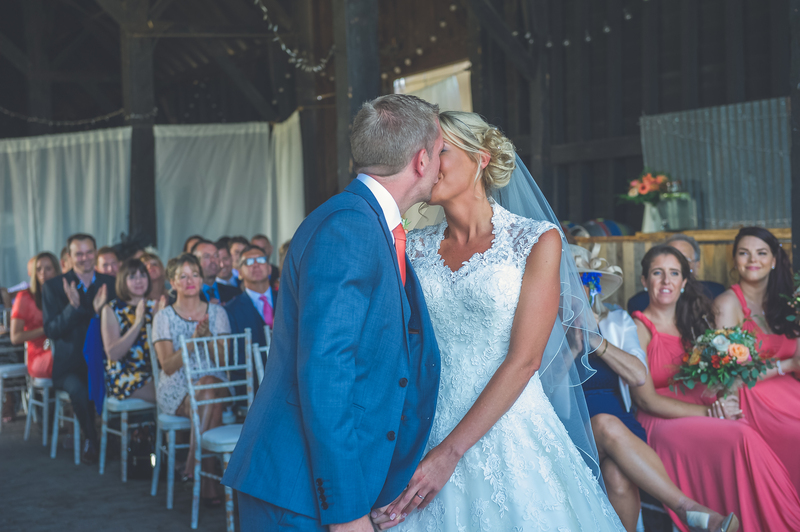 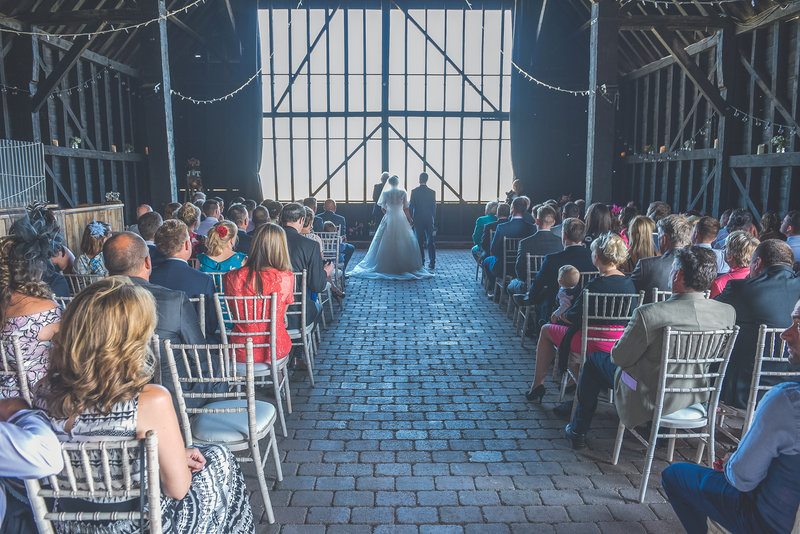 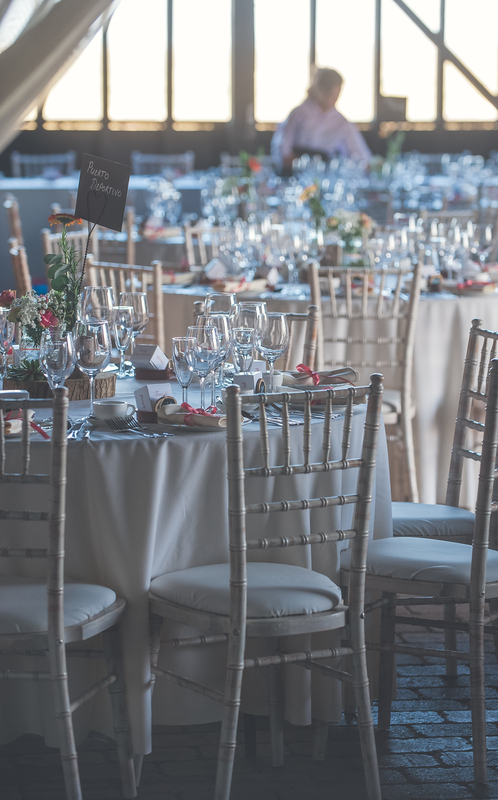 Afterwards James and Toni exited through the huge barn doors, and the large grassed courtyard was the perfect backdrop for drinks and canapés in the sunshine – it was such a hot day! 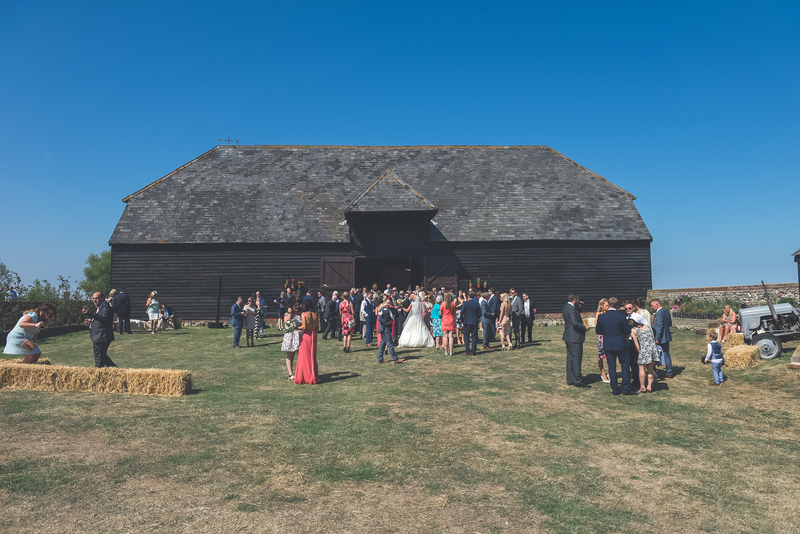 We found some shade in the smaller open barn for a few group photos, before heading off with James and Toni for some couple portraits in the long grass overlooking the marshland. 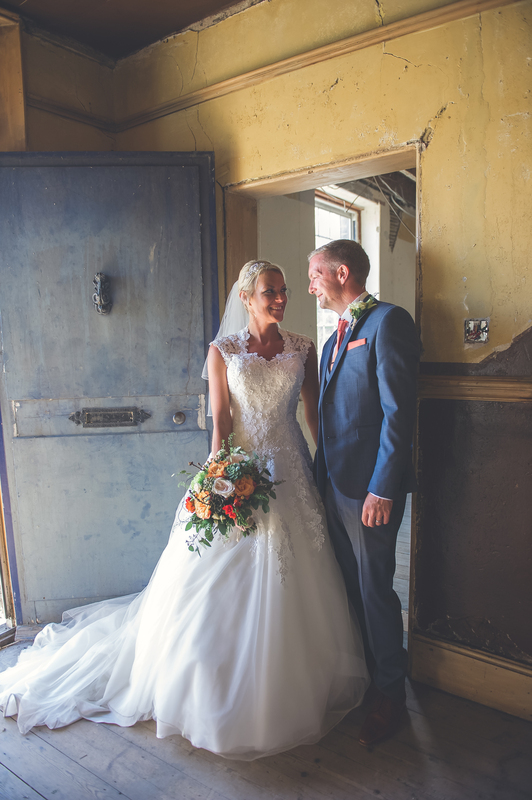 We stumbled across the most incredible derelict house in the grounds which was perfect for a few intimate photos. 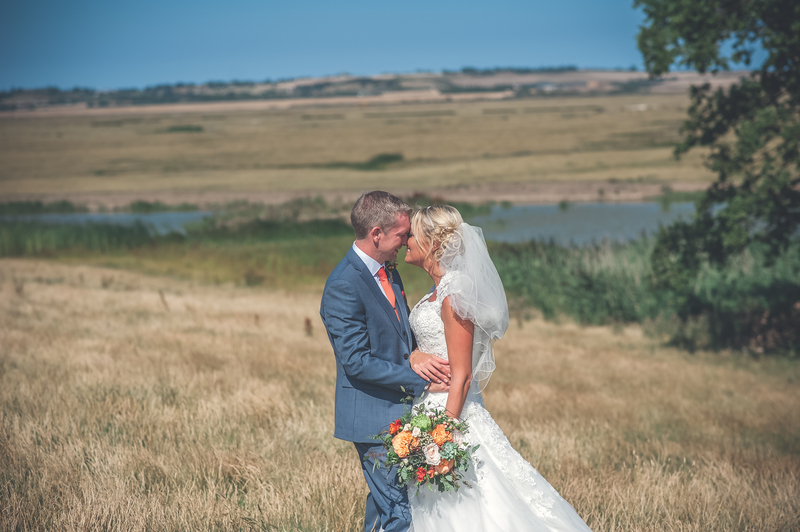 James and Toni then headed back to their guests with the plan that we would head out later to catch the evening light which was promising to be amazing. 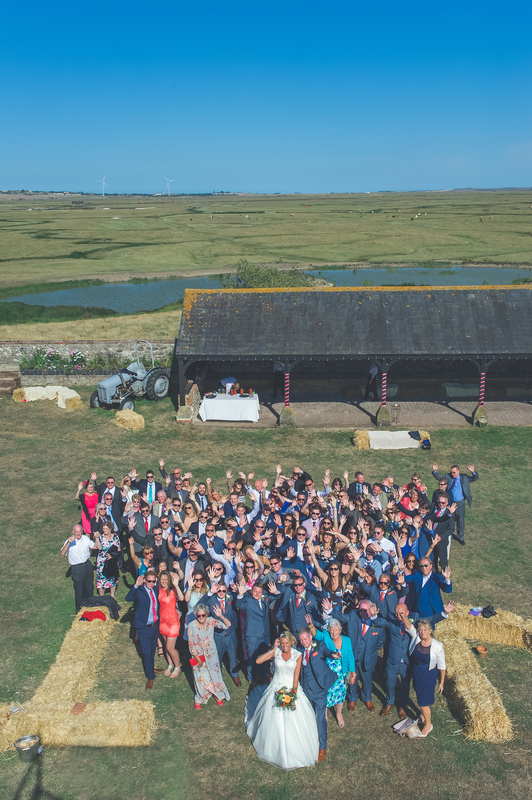 After confetti and a large group photo (taken from a handy scaffolding tower!) 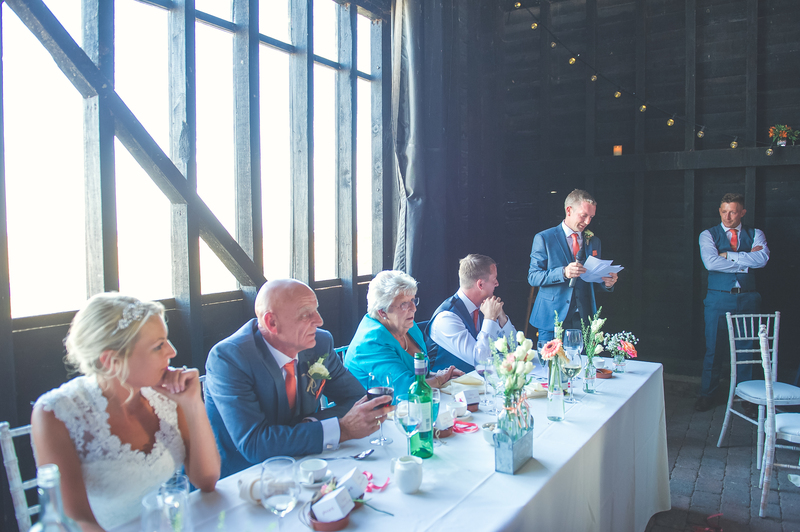 it was time for the wedding breakfast and speeches. 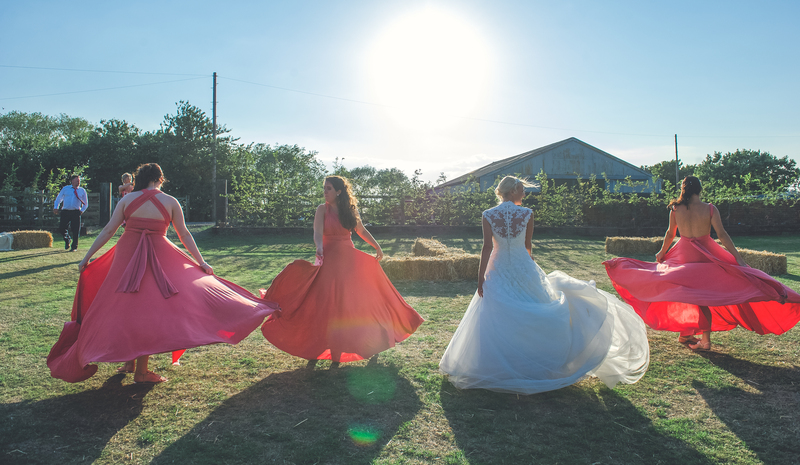 One of the most enjoyable parts of a wedding day for us as photographers are the evening light photos. 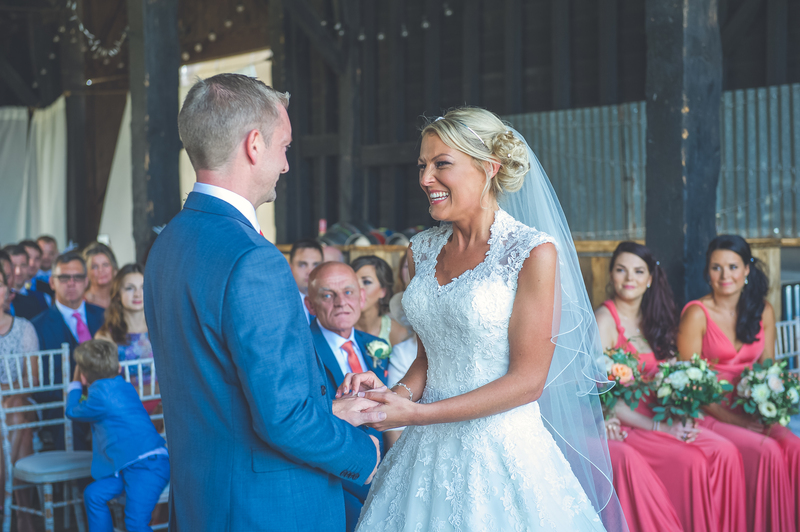 We always suggest to couples that they save a bit energy for this as it’s the perfect time for some photos without the pressure of time. 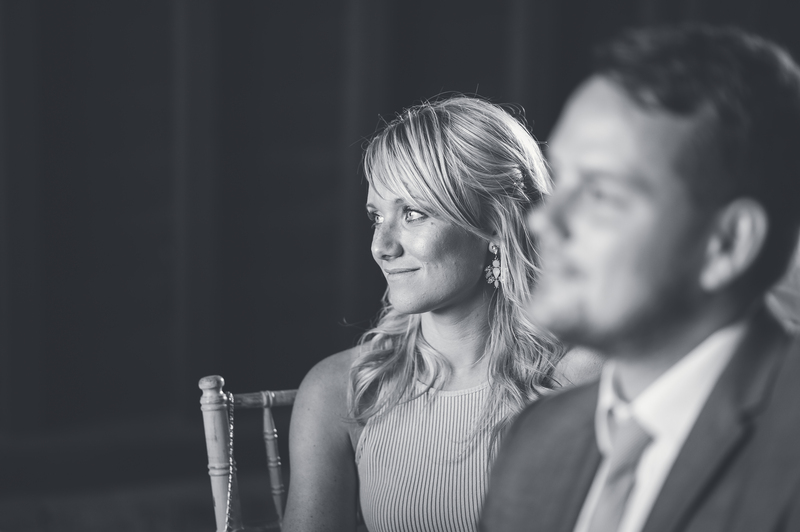 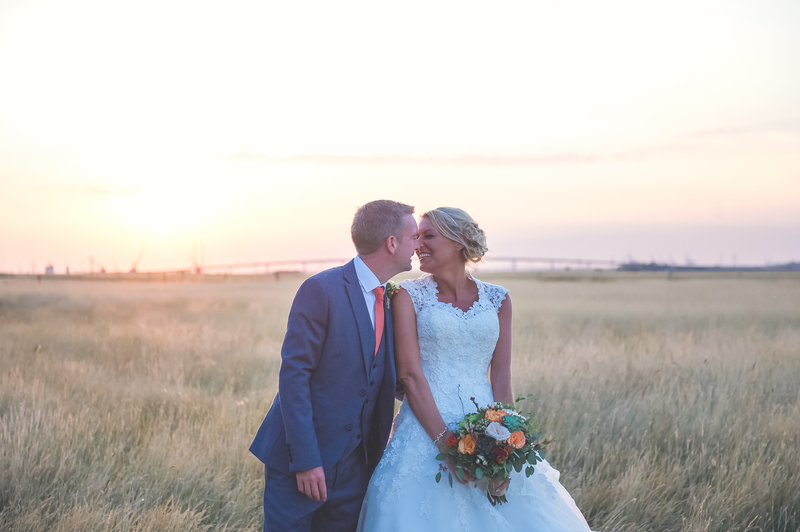 These are often the best photos of the day as the light is soft and golden, and generally couples are feeling much more relaxed! 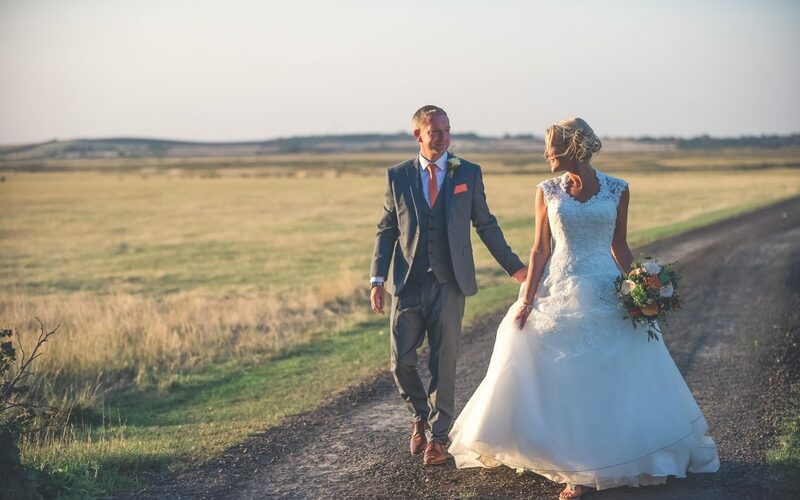 At Elmley the evening light was absolutely perfect with the sun slowly setting as we wandered around the landscape, with its far reaching views across the marshes and the Swale Estuary. 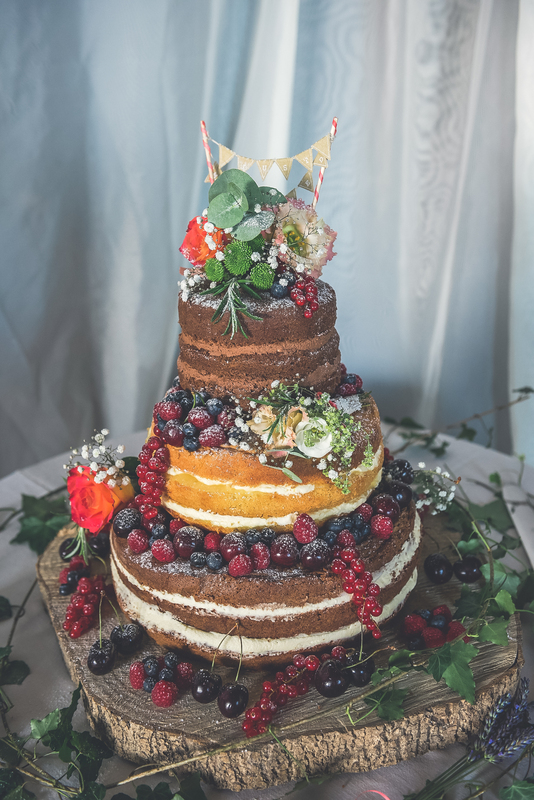 Back inside it was time for James and Toni to cut their beautiful naked wedding cake, adorned with flowers and fruit, and made by Toni’s very talented Auntie. 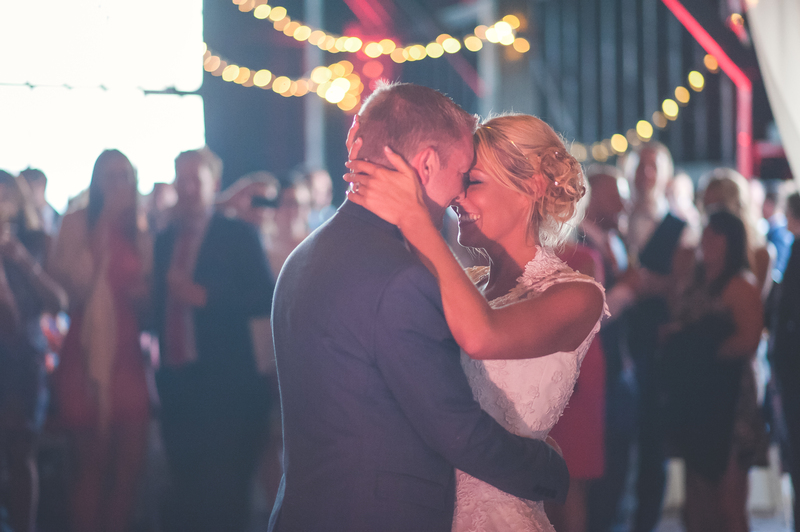 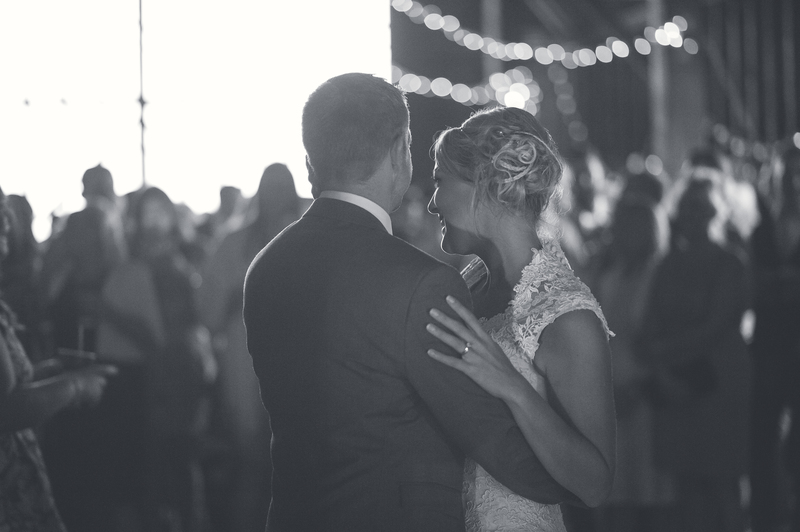 This led into their magical first dance as the light faded; it was lovely to see how everyone was captivated by it as they gathered around to watch. 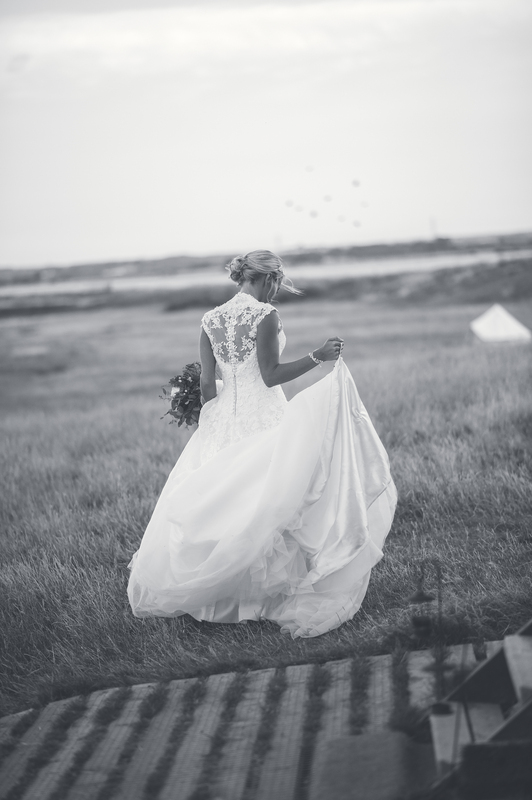 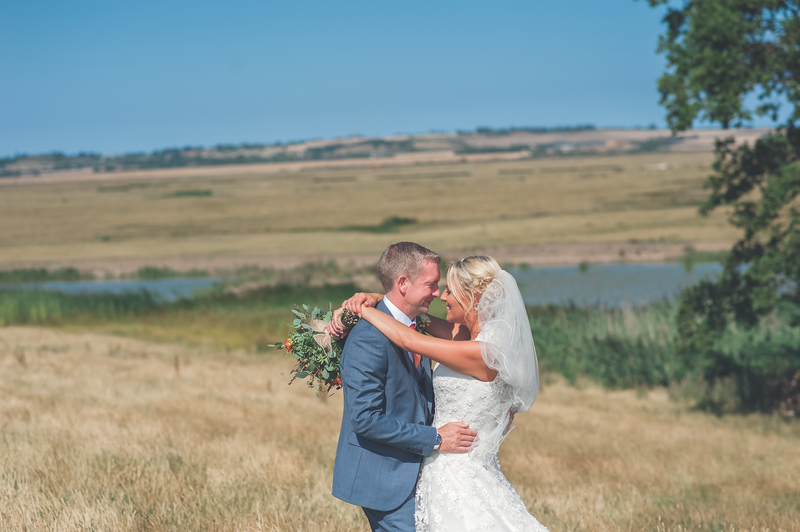 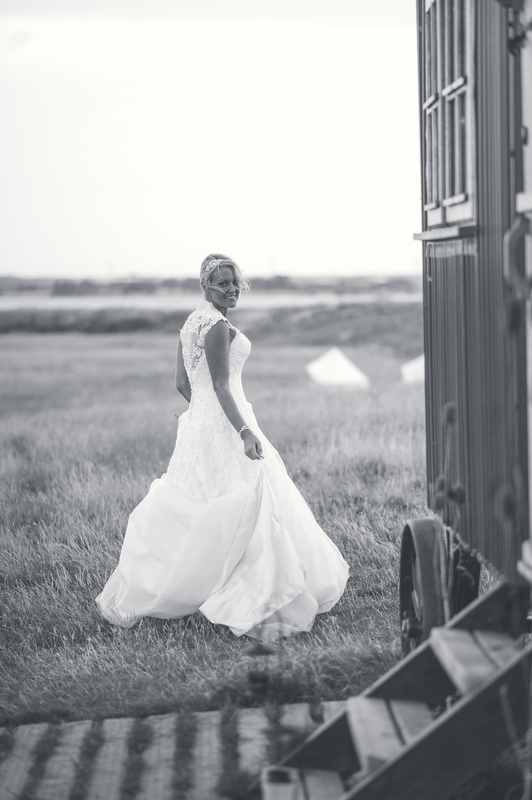 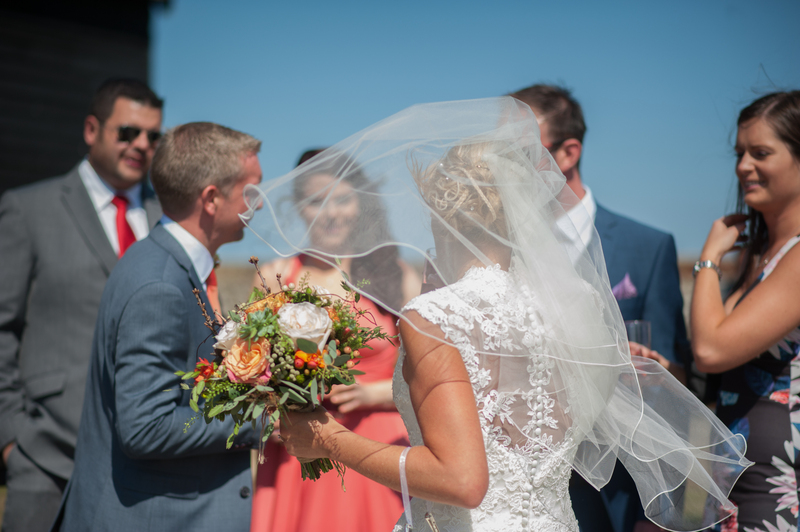 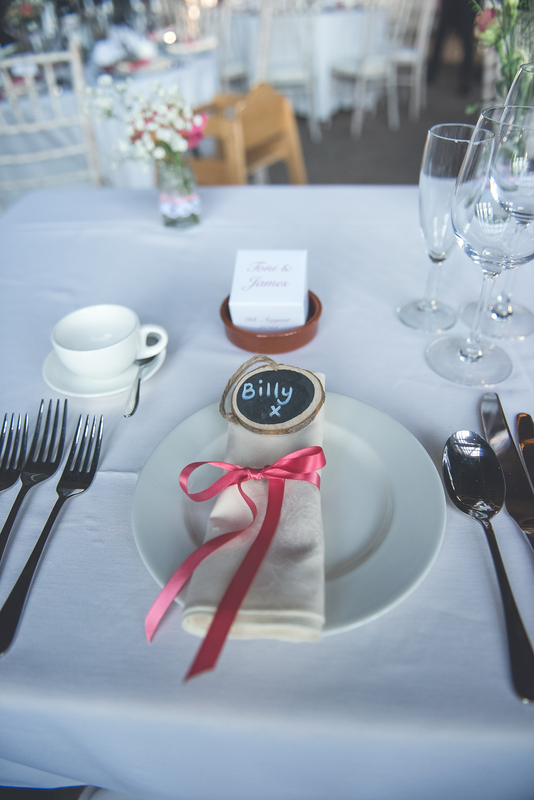 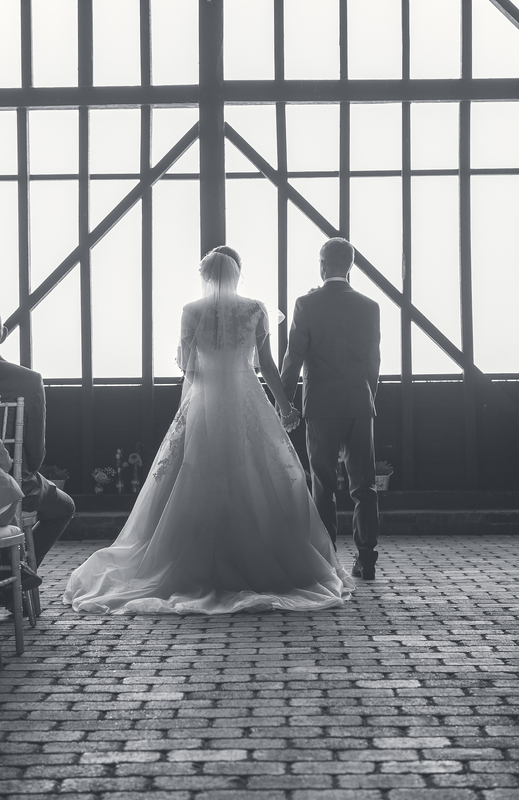 The big skies and the endless views across the Swale estuary, together with the cattle and the wildlife that call this area home, are what makes this wedding venue so special. 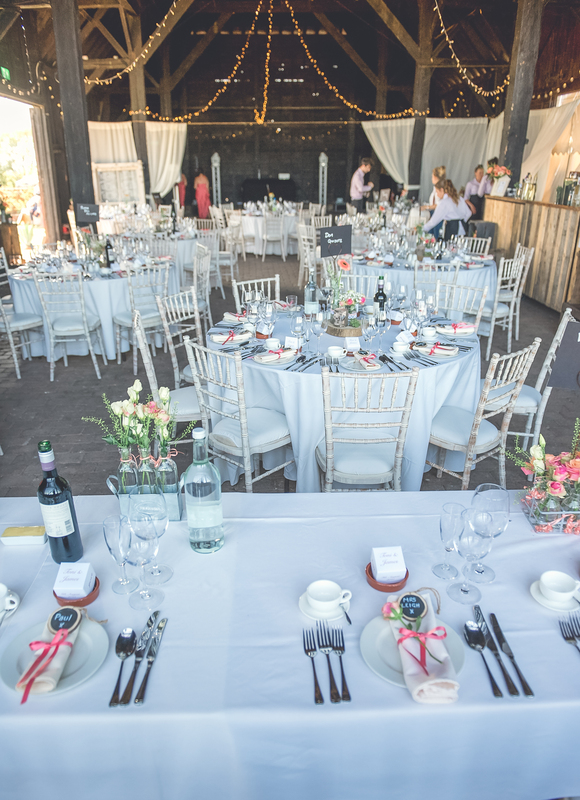 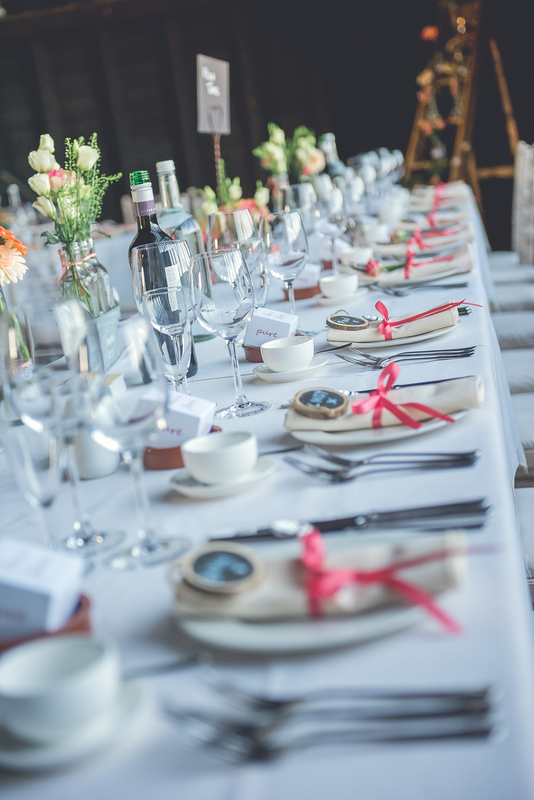 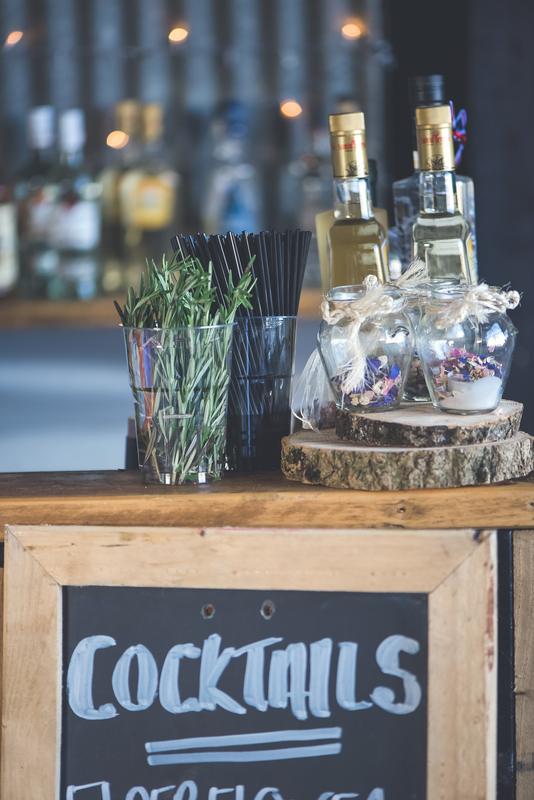 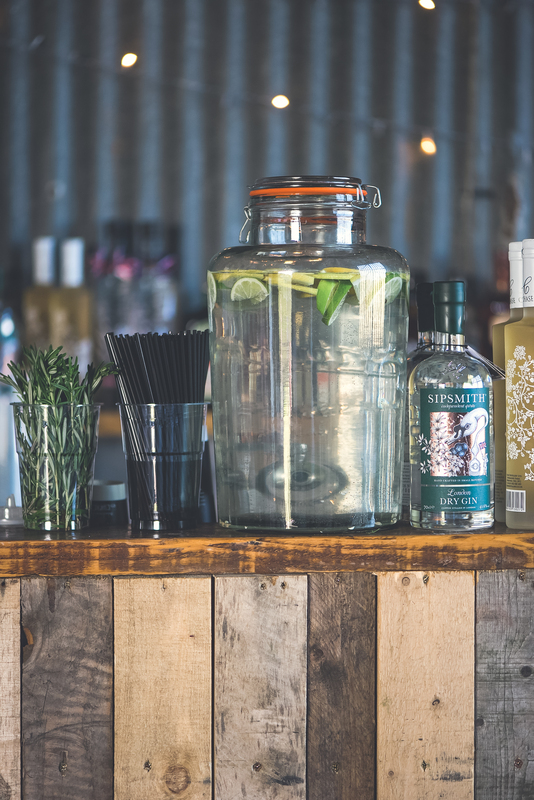 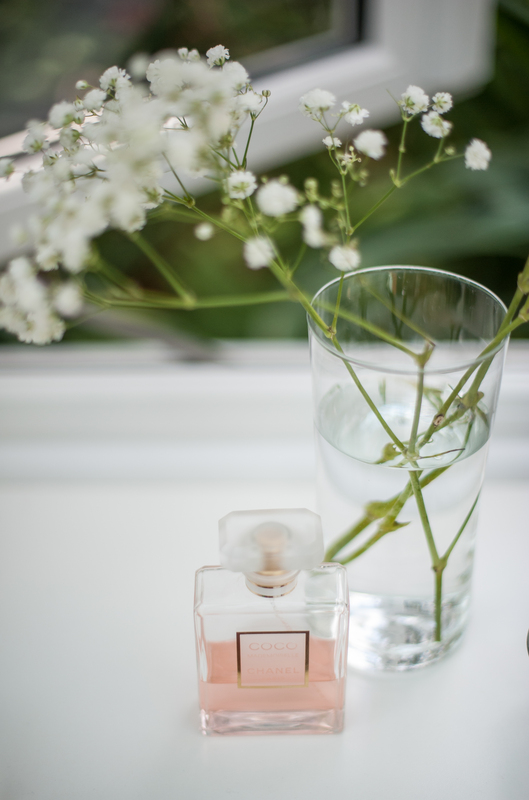 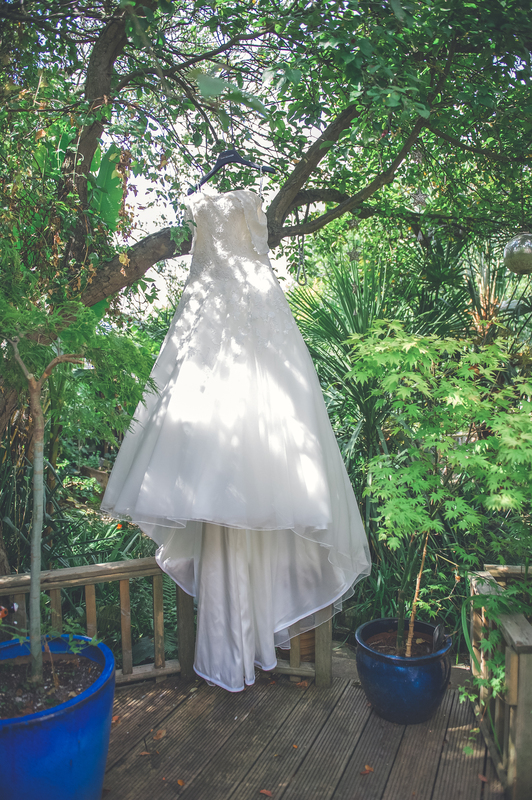 After the wedding, the bride, groom and their guests can enjoy a wonderful nights sleep in the middle of a nature reserve, in bell tents or bespoke huts – the perfect end to a perfect day.